No one gets to avoid having challenges in their life, so I have made a point to observe myself and others as they deal with challeng and share what I learned. Lately, Jane has been facing the challenge of being the oldest in the family. She has two little sisters that are still very young. They don’t know how to be a pretend daughter or a how to never touch her special items. As you can imagine this is exhausting for Jane, me and her sisters. Jane is also learning how to deal with disappointment. If she wants something and she doesn’t get it, she will cry, complain and act as though I am ruining her life. I don’t know where the dramatic flair comes from, but I am not much better in responding to this. A few days ago Jane was asking for something…food, TV, her sisters to leave her alone. I honestly cannot remember what it was, but it is usually one of those. “I HATE you!” she says with gusto. “Then you should go,” I maturely responded. A few minutes later I hear Jane moving around upstairs in her room. Eventually she comes down with about five bags of varying sizes filled with a pillow, her blanket, some stuffed animals, clothes and a few favorite trinkets. She was so serious and it was hard not to laugh a little, but I knew we needed to have a serious talk. I knew that part of the reason she was running away was because I had told her to go, so I had to explain that I never wanted her to leave our family and house. I wanted her to go to her room or just generally separate herself from the problem for awhile, but running from what was hard for her was not the answer. Running away was dangerous and would make all of us really sad. We went back and forth about why she should stay. Eventually we exchanged hugs and she took her bags back up to her room. The next few days continued to be tumultuous for Jane. The next time she threatened to run away was with her dad who took her door off the hinges. I had already taken all of her bedroom trinkets and hid them in the basement. To say the least, Jane was facing challenges this week. After I reflected on the events of this week, I thought about myself and how I deal with hard things and consequences of my own decisions. Run away from the problem. I may not be going to my neighbors house to stay, but I do contemplate getting away too often. Blame it on people that seem to be the problem. I’d be happy if my kids weren’t so hard or if I had this or that. Think about how hard my life is. Fill my mind with doubt, anger and frustration. 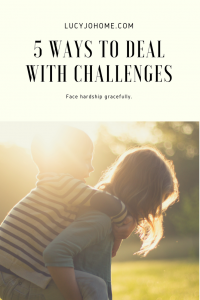 Thankfully, I can learn how to face challenges more gracefully. The first step is to face challenge head on. Staying to resolve the problem is not easier than running away, but the results are richer. Our relationships with people who love us are almost always worth preserving. Finding ways to endure and persevere will help us be more compassionate and creative. The second step is to own the consequences and start with myself. I may not be able to change others, but I can change myself. I try to focus on what I CAN do and let go of what is out of my control. When I deal with conflict with my husband Cody I want to blame him, but really I am just sad about something and I need to be accountable for my feelings and change within before I demand changes from Cody. Third, let other people bring you comfort and cheer while you tackle your hardships. There are so few people I can truly cry with. I don’t like to cry and for some reason crying is weakness in my mind. But, it is so, so important for me to have some people that I can be completely real with, tears and laughs. Hold onto those friends that love you when you are at your best and at your worst. They are special and it is okay to lean on them when you need it. You will likely be that shoulder they need at another time. Fourth, reach out to lift someone else. My first year of teaching didn’t look anything like the inspirational movie I can created in my mind. I was coming into a class mid-year, and I had the classes no one wanted to teach. I actually had other teachers say sorry to me before I even knew why. My life was filled with fist fights, apathetic students, a crumbling personal relationship and a car accident. No other time in my life can compare with the despair I felt at this time. But then something happened; I decided that if I was going to find my way I would have to loose myself in service. I started working on family history, attending the temple weekly and started to look for the good in each of my students. Nothing liberates from our hardships faster than relieving another’s burdens. Lastly, I seem to do better during hard times if I can keep a larger perspective on my progress and on the trial itself. Attitude is everything. I wrote a few posts ago how I have a long list of things to do better on. One response from a friend and mentor was that I am more than a list and should focus on more important things like scripture study and prayer. She is completely right. I need to remember that I am a work in progress and there is nothing wrong with that. My struggles are part of a bigger plan to help me to be better and more able to help others. After Cody graduated, I faced pregnancy, moving across the country, and the uncertainty of job security. I was so stressed and anxious. Cody needed to find work, but he seemed determined to feel like he wasn’t good enough for the job available at the company. The past had taught me that trying to force Cody would not work. All I could do was pray, have faith and pray some more. I wrote in my journal a lot and supported Cody in all that he was working on. I encouraged him and may have worked on his resume, cover letters and applications. Eventually, my prayers were answered directly. Someone at work approached Cody about the available job and asked him to apply. Cody finally felt like he could apply. Cody was interviewed and was given an offer. I remember after it was over I was so grateful that I had handled the situation with faith and with an eternal perspective instead of being filled with anger, doubt and frustration. Remember that challenges have purpose in your life. Face them head on, be accountable for yourself and keep things in a faithful perspective! Do you know someone who faces their trials well? What do you admire about them? What are you learning from the kids in your life?